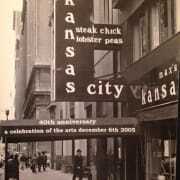 Our nonprofit, the Max's Kansas City Project, serving the arts and youth communities, connected to the legendary club/restaurant/bar, Max's Kansas City, formerly located at 213 Park Avenue South, NYC. and home away from home for the likes of Warhol, Patti Smith, The Velvet Underground, Alan Ginsberg, The Rolling Stones....needs a volunteer to add pages to and update our website. Please look at our website first so that you have a sense of the present web design, and of what the mission is of our nonprofit, and the significance of Max's as an iconic, cultural landmark and its impact on Pop Culture History. www.maxskansascity.org. www.maxskansascity.org has been created in word press. We need a volunteer with knowledge of how to navigate word press. According to Andy Warhol, "Max's was the exact spot where Pop Life and Pop Art came together in the 60's" Everybody who was anybody in the late 60's early 70's went to Max's. If interested please respond at: maxskc@aol.com Thanks so much and have a glorious day. dedication and commitment! Someone who can think out of the box!